Mastering options calculations is an essential skill needed to attain the very highest covered call writing returns. Although the Ellman Calculator will do most of the heavy lifting for us, understanding the reasons behind these calculations and when and how to apply them, will make us all more skilled investors. Rolling down: Closing out options at one strike and simultaneously opening another at a lower strike price. Mid-contract unwind exit strategy (MCU): Closing an entire covered call position mid-contract when the time value of the premium approaches zero and using the cash to establish a second income stream in the same month with a new position. STO $74 calls (ATM) @$2.50. Rolldown to $70 strike C’s @$2. Price rockets way up to $78. 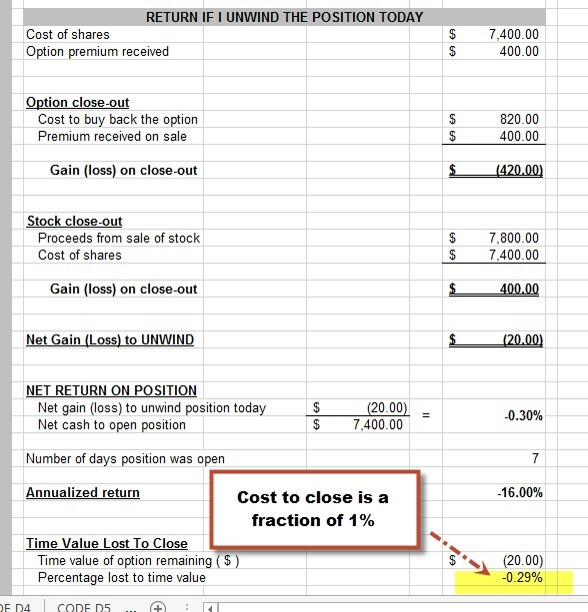 – Is my calculation correct for a -$4.20 total options loss, and +$8 for price gain to = +$3.80 profit? 1- We base our decision whether to completely close our short option and long stock positions based on the current market value of our shares which was rolled down to $70. We do not base it on some value in the past ($74). The time value component to accomplish this is $0.20 because the shares can be sold for $78 and gain $8 in share value at this point in time. If we can generate more than $20/$7000 or .28% (a fraction of 1%) by re-investing that newly-acquired cash, we should pull the trigger on the MCU strategy. Now, it’s up to us to write the final chapter that month and re-invest the $7800/contract to turn that small loss into a gain. We turn to our watch list of eligible stocks, find an appropriate price per share and check options chains. The information is fed into the Ellman Calculator as we make our final decisions. This is a great example of how being active can, in many cases, allow us to manage our positions to mitigate losses, turn losses into gains and enhance gains. For the week, the S&P 500 declined by 0.5%, for a year-to-date return of 1%, including dividends. BCI: This site continues to be bullish on the economy. It’s difficult to ignore years of improving economic reports. However, because global political and economic concerns we remain slightly bearish in our current holdings, favoring in-the-money strikes 3-to-2. I was reviewing your conservative in-the-money strike strategy and wondering whether the following strategy might ALWAYS give a profit for every stock and market situation with no chance of ever losing money? Buy BCI deep ITM strike with a 2% premium and downside protection. Over the contract period – if the share price of BCI goes upward, sits tight, or drops by less than the downside protection – don’t do anything. As soon as BCI drops mid-contract to lower than the strike price, buy back the option and sell the stock immediately (hopefully doing both before BCI drops below the breakeven price)? ie you make 2% or nothing on the trade. Also, if this IS a 100% never-lose flowchart, is there a broker that might automate the entire process for us so we don’t need to check share price every day ? I admire your effort to use the BCI methodology to locate that perfect strategy. Thinking outside the box is what makes us all better investors. One thing I’ve learned over the years is that there is no free lunch and no strategy that returns greater than the risk-free returns (treasuries) that is 100% guaranteed. 1- A stock price can gap-down and even if we wanted to sell @ the strike, there is no guarantee we will get our price. 2- To generate time value of 2%, the strike certainly can be ITM but not DEEP ITM unless the stock has huge implied volatility…so the strike will be below current market value but not out of sight. 3- In our books/DVDs we review the time value of different strike prices and ATM strikes offer the greatest time value and will therefore cost the most when buying back the option…so there will be an option DEBIT in this hypothetical strategy. In other words, the time value generated from the sale of the option (ITM) will be less than the time value it will cost us to buy back the option (ATM) before selling the stock mid-contract. Thanks for sharing your ideas and I encourage you to continue to do so as i do every day so we can share with the BCI community and all become better investors and learn from each other. But would my (no lose) plan work if I make slight adjustments ? ie. Buy BCI shares at $80. I buy a ITM strike at $75. I acknowledge that Time Value increases as share price falls towards the strike, but Intrinsic Value of the option will decrease – meaning there might be an option CREDIT. Or am I wrong? 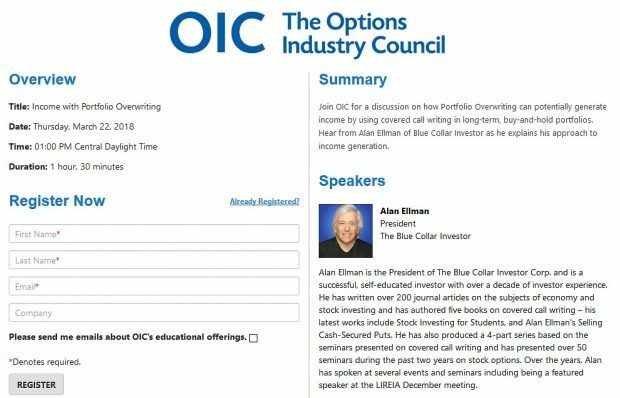 If I buy back the option (at a net option CREDIT) when BCI reaches $76 (80% of the way down for option with delta of 0.9) can’t I break even almost every time? Free lunch today, or have I missed something? If this works, then it’s like there are mathematically only 2 outcomes – make money or break-even. ie I can’t lose on any trade? Sorry to say but you will still have to pay for lunch although with your initiative and motivation I suspect that it will be with a discount coupon so you will pay less than most others. Let’s say you sell the initial option for $6, $5 is intrinsic value (not profit) and $1 time value or a little more than a 1.3% initial return. 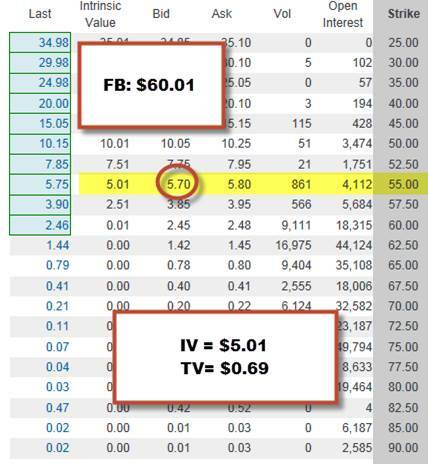 Now your shares are worth $75, not $80 as we use the $5 of IV to “buy down” our cost basis. As the share price approaches the strike mid-contract the TV will rise despite the impact of theta (time value erosion). If share price reaches the strike, there will be an options debit. 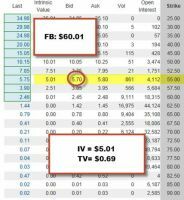 If share price reaches $76 when closing you will pay the TV + $1 of IV and you will sell for $76 so IV is practically a wash. The key is to watch time value…that’s what lunch will cost you. The Weekly Report for 03-28-14 has been uploaded to the Premium Member website and is available for download. Now I do want to continue from my other questions, for what actions are best depending on the look of the stock charts. 1. If at expiration my stock(s) is channelling s/ways and either above or below the 20dEMA(or both EMA’s), then is it best for me to sell shares(or allow assignment), to reduce any risk of price falling? 2. Does it depend here on if MACD,etc confirming indicators are positive or negative? 3. When buying a stock is it alright if it is channelling s/ways, or does it always have to be trending up above the EMA’s? 4. If I see a divergence on the MACD or Slow Stochastics(or both) for the S&P500, then shouldn’t this act as a warning not to buy stocks yet, – and maybe more so if these indicators are going down? 5. Also this is just a personal experience, as I was also going to do some practice trades at start of month, but because after seeing negative divergences on the S&P500 I decided to wait. It’s just as well I did as the market has pulled back a bit, so will likely now put on some practice trades. I’m just wondering though if what I did by waiting for a market pullback is a good idea? Should I have entered(bought) and done some trades at start of cycle anyway?, have you yet? 1- Technical analysis is as much an art as it is a science. I look at the mosaic presented by the 4 indicators discussed in my material and that will lead me to stock and strike selection. A sideways moving stock that has great fundamentals and meets all our “common sense” principles may be a good candidate for selling ITM strikes. Another factor I consider is how is that security performing compared to the overall market? 2- Yes, that is one of the factors but not the only one as stated above. 3- Yes, these stocks are eligible but I tend to favor ITM strikes. 5- I am almost always fully invested…2008 was a rare exception. The question is how aggressive should I set up my portfolio at that point in time. It is important to remember that if and when a trade turns against us, we have an entire arsenal of exit strategies to mitigate losses, enhance gains or turn losses into gains. Position management is critical. Thanks for getting back to me. But for your 1st answer, how would I know if the s/ways trending stock at expiration still has great fundamentals if the premium report comes out after expiration?, wouldn’t I have to beforehand make a decision either to keep or sell the stock?, or could I look back at the previous weeks P.report to see if passed fundamentals? One tactic you might think about is to buy a protective put if you want to keep the stock through earnings. The put would only be in place for a short time, just through earnings, but would protect you in the case of a bad ER. The negative is that the put price would be higher due to the implied volatility prior to the ER and if there wasn’t any negative news, the put would lose value due to a drop in the implied volatility called”volatility crush”. But…your downside would be protected. Fortunately, we don’t need to read through all those accounting stats because they are part of our BCI screens so prior to an ER, fundamentals are usually still okay. A quick check of the BCI Premium Report is a quick way to confirm.